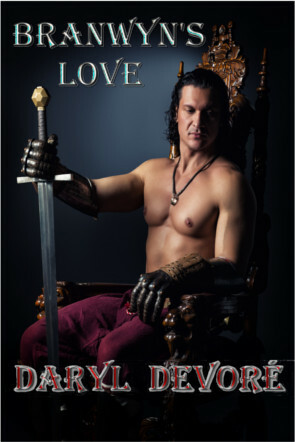 Daryl Devoré pens another hot read – the medieval romance –Branwyn’s Love. “I do not understand, Gon-Dra.” She gripped his hand and let him assist her. “Call me Malacke. Use my name. Not my birthright.” He busied himself with his horse, loosening the reins and leading the animal to the river. While it drank, he opened a sack and pulled out a wineskin. He removed his knife, cut off a chunk of bread and cheese, then handed them to Branwyn. She accepted it then settled under a willow tree near the creek’s edge. He sat beside her and ate his meal. Finished with her lunch, she sipped her wine in silence, admiring the sound of the creek and the birds. With quick glances, she studied Malacke. His eyes were the depth of some of the blue flowers in the garden. A faint scar marred his left cheek. His face was shorn of beard, but for the slight stubble of a new day’s growth. His features were pleasing— very pleasing— to her. Why did his deep voice make her heart beat faster? He did not let her finish her sentence. He reached behind her neck and pulled her face to his. His lips parted. She felt his breath, then nothing. She glanced up at the word love. He pressed his lips on hers and grasped her so close her breasts compressed against his chest. She released him with a gasp. Her gaze did not leave his. She pulled his face to hers and planted her mouth on his. He opened his lips. She did the same.